As a child, I dreamed of becoming an elegant ballerina but it was one of those things in life that was not meant to be. For years, I begged my mother to let me take dance lessons like my childhood best friend, Debbie Koontz. My parents refused by saying that the dance studio was located too far from our house on Goat Pasture Road and besides, dance lessons were too expensive. Mother also did not feel that I needed instructions in dance since she had already discovered my “talent.” Our family had inherited an old upright piano from my paternal grandmother and I had played it out of sheer boredom for most all of my life. While I could easily capture any melody by ear, my form was stuck in the basics of chords and one finger pecking. Consequently, instead of dancing, mother signed me up for piano lessons even as Debbie Koontz took the dance lessons I wanted for myself. When we spent the night together, Debbie would show me all the steps she had mastered, the shuffle steps of tap, the jazz hands of jazz and the holy plies of ballet. I remember coveting Debbie’s beautiful recital costumes, full of sparkle and froth, as well as her pale pink satin ballet slippers. It was like a mark of womanhood when Debbie went thru the dancer’s rite of passage and finally received her first pair of toe shoes. More than forty years had passed since my last sleep-over at Debbie’s house and I had still not forgotten how badly I had wanted to be a dancer. Upon learning that a friend of my son’s was taking adult ballet lessons in nearby Clemmons, I shared with her my childhood story. “Come to class with me,” his friend Devon encouraged. “This class is not for people who have danced all their lives. Everyone’s a beginner. Besides, there is a mix of ladies in there. In fact, one of them is a mom like you.” My eyes lit up. What a great idea! I could do this. I briefly considered my health. I was not in the best shape. “Ballet for adults” is obviously not without its risks. In addition to the potential damage to my self-esteem, there would also be a risk of physical injury. Regardless, I became something of a risk-taker on the verge of my golden years and I figured if I had the chance to mark something off my bucket list, I was going to do it. On the evening we were to attend the class, I was a bit late leaving work. When I got home, I couldn’t decide what to wear. “What to wear?” has been the eternal question that has plagued me for every event in my life. When I die, would someone please remember to etch those words onto my tombstone and make this final wardrobe selection for me? I called Devon to ask for advice. She suggested I wear yoga pants and thick socks. I perused the drawer of my casual pants. Hmmm, I wasn’t 100% clear on what she meant by “yoga pants.” I owned one pair of grey sweat pants that were slightly flared at the bottom like yoga pants but they did not seem very danceable. Since it had been a warm day, I thought maybe I should wear something cooler. I didn’t have a lot of suitable clothes to choose from. Finally, I found some beige capri length pants and paired them with a white v-neck tee and my metallic flip flops. I didn’t own a full length mirror but I could tell from the view of my upper half in the little bathroom mirror over my sink that I looked decidedly “un-ballerina-ish.” I needed some drama. I needed to look like the girls on So You Think You Can Dance. Maybe I needed to channel Irene Cara on Flash Dance. I remembered an orange and lemon sherbet- colored scarf that was buried in my closet and so I dug around until I found it and wrapped it around my neck and shoulders. I felt I looked a bit more like a dancer although certainly not a ballerina. I noticed the clock said a few minutes after 7 PM. I had to leave right then or I would be late! I drove like a mad woman to Devon’s house. In my rushing, I forgot to bring my socks so I called ahead to ask Devon to bring me a pair of hers. As she slips in the car and buckles her seat belt, she gives me the once-over out of the corner of her eyes. I can tell I have missed the mark on the wardrobe. Sensing her disappointment, I begin explaining the confusion over the pants and the scarf. Devon seems more concerned that no one will be able to see my knees which I consider a blessing. I realize that Devon is wearing a black leotard beneath her yoga pants and that I have failed to understand the complex layers of a ballerina’s wardrobe. Then, she confesses that the only clean socks she could find were either toe socks or tube socks. My mind flashed back to the multi colored toe socks I wore in 1976; every toe was a different color. Thank God she decided to forego the toe socks but I can tell that the purple and pink- banded tube socks she brought me are not going to match the sherbet hues of my scarf. We arrive at the dance studio with seconds to spare. I enter, feeling awkward, and begin looking for the other mothers. The instructor asks me if I plan to dance and I assure her that I do. I had not dressed up for nothin’. I spot some glittery costumes and accessories in a basket but Devon discourages me from inspecting them too closely. Instead, she instructs me to put on my mismatched tube socks. I decide that rolling them down might be more comfortable and make me look less like a deranged football player. Although my knees do not show, if the instructor is quick, she can catch a good four inches of my lower calf. At Devon’s suggestion, I remove the scarf. “Gosh, there are a lot of mirrors in here,” I think to myself as I gaze around the room. The barre on the wall was mounted so high, I asked Devon incredulously if we would have to put our legs up on it. Honestly, I could have hung upside down on it like a monkey bar. My next thought was that before we got started, I needed to find a bathroom. 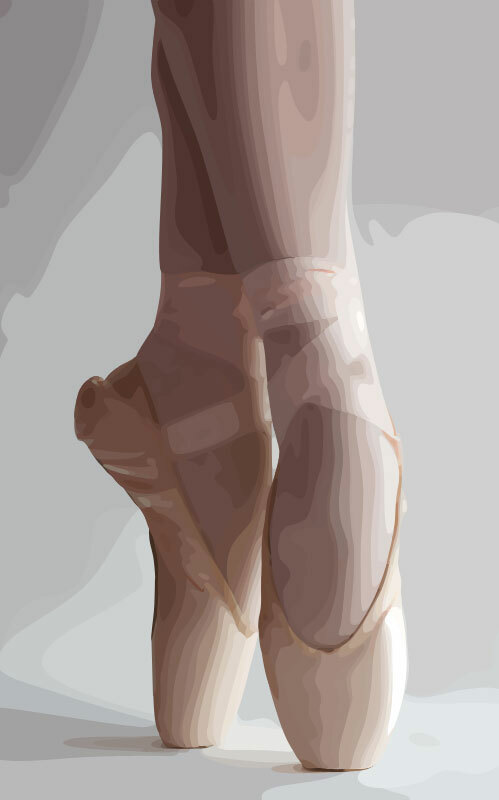 Even though I am a newbie, I know that incontinence and ballerinas do not make good dance partners. The instructor suddenly calls the class to attention before I have a chance to use the restroom and we make our way to the dance floor. I am concerned because there does not seem to be any other moms in the group. There are five students in the class, Devon, myself and three other high school girls. “Where’s the mom?” I whisper to Devon and she gestures towards one of the girls I thought was in high school. The “mom” was thirty, at most. She wore the same wan expression atop her waif- like body as all the other dancers. “Geez, am I the only one here with breasts?” I thought. I try not to look at myself but there are so many mirrors, I cannot help myself. The other girls look like real ballerinas in their black leotards and pink ballet shoes. I look ready to go grocery shopping. It is overwhelming but I try my best to keep up. I am not a quitter, unfortunately even when it is in my best interest to do so. Obviously I am traumatized and delusional; I think I am doing okay, until we perform the coup de grace. We line up at the short end of the studio. Mary changes the music to something that sounds like the composer was “hepped” up on too much caffeine. She commands us to perform a series of moves whose locomotion will propel us thirty to forty feet across the room to the opposite wall. The moves are like gallop- squat- hop- slide… gallop- squat- hop- slide. Mary looks at me sympathetically and suggests I forego the arm movements which I wasn’t trying to do in the first place. Suddenly I realize that I am on my own, unable to hide amidst the other girls. This is like a race and I am losing, big time. I lurch behind the other girls, sans arms, like a headless rooster. Then, in addition to being unable to master the movements, I make two mistakes. I simultaneously catch my reflection in the wall of mirrors and see the faintest twinkle of amusement in Mary’s eyes. I complete my gallop- squat- hop- slide to the other end of the studio, yards behind the other girls. Suddenly, I am overcome with emotion. Then, I need to pee. The former happens to me on very rare occasions while the latter is becoming more frequent. I try to hold both feelings in but something between hysterical laughter and hysterical tears wells up inside my throat while the other end is welling with something else altogether. My eyes redden and my face contorts unattractively. Mary looks at me as if she is afraid I am having a stroke. For a minute, I actually hope that I am having a stroke and I hope that Mary feels guilty for smirking at me just before I die. I am not spared a quick death. I make it home and tell my husband of my latest fiasco. We’ve been married a long time and he is no longer surprised at anything I do. Then, out of nowhere, the emotions I had swallowed in the dance studio begin to rise again. I grand plie into a full- fledged hissy- fit with real tears and a very ugly cry. Hubby looks concerned. Bless his heart, he really does. “Oh my God,” he exclaims. “This sounds exactly like an episode of I Love Lucy.” Perry has seen every episode of I Love Lucy at least forty times, no lie. I have not seen them and I have no idea what he is talking about. “There was an episode where Lucy wanted to be a dancer,” Perry continues. “At the auditions, she rearranges all her clothes to look like the other dancers by pulling the neckline down over her shoulders and her pants legs up. Then, she tries to copy the moves of the other dancers…” His voice trails off and we both fall into a wave of hysterics. “Yes, that’s it, exactly!” I say. How had I failed to cast myself as Irene Cara when I was really Lucille Ball? In hindsight, I would still love to be a ballerina but I’ve decided that I should literally move on. Maybe I will try salsa? Or square dancing? Both Lucille Ball and I are simply too loud and colorful to be good ballerinas, even if we could manage to master gallop- squat- hop- slide while simultaneously showing the car behind Door Number 3! Haha on the shoes Shirley! Everyone was a dancer but me!!! Wow- have a fantastic time in Italy! I wish I were there but will look so forward to seeing you all in May! It will be here soon. I can’t wait to give you ladies a big hug!!!! even though you were not Pavlova, but Lucille Ball!! I wanted to become a dancer, too. I was Obsessed. I read books about Kirkland, Baryshnikov, Isadora Duncan, Twyla Tharp, Pavlova, Fonteyn, Rudolf Nureyev, and many others. Thus, when I took class, I could barley do one combination!! A girl can dream and still appreciate this art form….I guess that’s why I decided on Poetry! Oh my Susan! At least it is off the bucket list now and on to other new experiences. I decided to take Jazzercise and was humiliated by the 60 – 80 year old crowd that could keep dancing for an hour and never break a sweat. Meanwhile I am sure that the squeezing feeling in my chest wa a sure sign of an impending heartattack and my face was so red that one of the old ladies asked if I was okay….